Championship coaching comes down to imparting wisdom of experience to raw talent. In February of 2013, I was watching the Toronto Maple Leafs play during the shortened, 2013 regular season. The young Leaf team was having more success than the Leafs had enjoyed in years. The thought struck me that one reason for the team’s success was that the Leafs’ experienced and successful head coach, Randy Carlyle, was teaching the team to play playoff hockey during the regular season. Coach Carlyle was imparting the wisdom of his experience to the raw talent on the Leafs’ roster. On an intellectual level, there should be no difference between how you play in the regular season and how you play in the playoffs. After all, it’s hockey and you are trying to win the game. However, playoff hockey has a distinctively different look/feel/flavour characterized by grit and sandpaper, intimidation, attention to defence, the willingness to sacrifice one’s body for the sake of the team and an awareness that every goal scored and every goal prevented is critically important. A sense of flowing urgency, you could say. Upon reflection, I realized that I too, was teaching my team to play playoff hockey during the regular season. For example, a point that I stressed was that when you have a lead, there is a point in a game when you don’t need another goal to win the game, and that playing smart and disciplined defensive hockey is what is required. So, in most games during the regular season where we held a lead, I insisted that they play what I call “shut em’ down hockey”, which is just a coined phrase for smart and disciplined defensive hockey where the overriding focus is minimizing the chances of the other team scoring a goal. The reason why a coach must insist that your players learn to play playoff style hockey during the regular season is that if they have not done so by the time the playoffs begin, it’s too late. In the playoffs, reactions must be ingrained and automatic. But teaching your team to play playoff-style hockey is still not enough to win a championship. Clearly, you need talent, but even talent is not enough. In any winning championship, the truth is that you also need bounces and breaks, and good old-fashioned luck. But equally true is the adage that you make your own luck. Coaching championship hockey requires coaching which motivates your players to buy into the system, to make the correct decisions and to minimize mistakes. It also helps them get over the mistakes they make and learn from them so they don’t make them again. In short, you are teaching your team how to be mentally tough. In any competition between relatively equally matched teams, the winning difference is often as small as one thought. 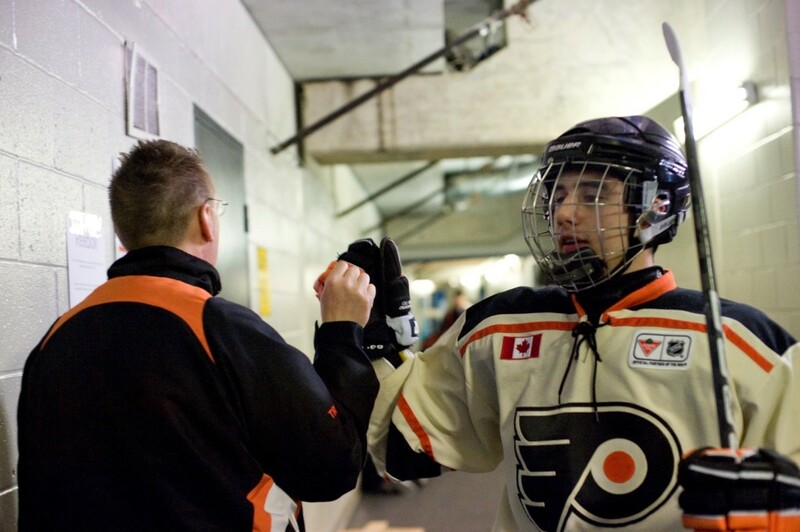 Last season my team, North Toronto Midget Jr. AA, won the GTHL overall championship and two tournament championships. The one thing that defined the players on this team was their mental toughness. They bent at times, but they never broke. In one playoff series, we had to pull the goalie in three games and ended up tying all three by scoring goals with 46, 9 and .6 seconds remaining in the game. The final game of the series was tied after regulation and went into overtime. The other team hit the crossbar and we scored. The winning difference was .6 seconds and part of a thin iron bar. One can say that we got lucky, and no question we did. However, I believe that we made our own luck because the team was mentally tough, prepared to play playoff-style hockey and made the right decisions when it counted. Jonathan Fine is the head coach of the North Toronto Midget “AA” team and is the author of various books on hockey and golf. Mr. Fine’s latest book, “How To Win Hockey Playoff and Tournament Championships” is available now. Mr. Fine can be contacted at jfine@finedeo.com.